Walking fights fat, boosts energy levels, and even protects your heart. But if you have type 2 diabetes, using interval walking as an aerobic exercise may be one of the best kinds of medicine. 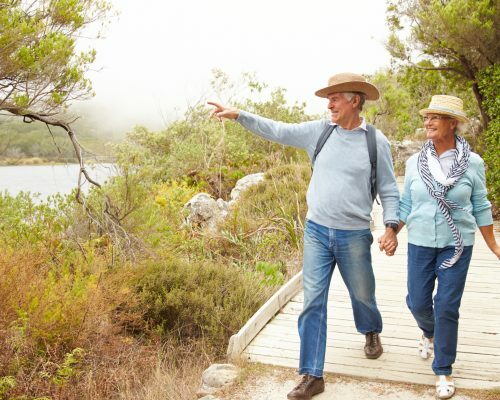 Results from a study published in Diabetes Care have shown that diabetics can improve their health and reduce healthcare costs by doing one simple physical activity. Not only this, but they can increase their individual physical activity with a simple counseling program. The benefit to both is the minimal time and effort required. In the study, participants were counseled to increase their physical activity. After two years, the performance of those affected was assessed again. Interestingly, 69 percent of participants continued to show improved health as they gradually increased their physical activity. Sixteen percent did not achieve any increase. These results are consistent with those of other studies involving people without type 2 diabetes. Generally, walking can help prevent diabetes by reducing the amount of abdominal fat you have. This is the type of fat that raises your risk of diabetes in the first place. That’s because the excess fat around your abdomen can bring about inflammation in cells, making them even more resistant to insulin, which is the hormone moderating blood sugar. When your body becomes resistant to insulin, this increases your chances of developing the disease. Walking also lessens the severity of diabetes and even reduces its complications, such as heart attack and stroke. A good way to start is by increasing your walking distance by at least 1.2 miles every day. That means 30 minutes or 2,400 steps, which is quite achievable for most people. Of course, what’s more optimal is 3.2 miles (77 min or 6,400 steps), if not more. If you can’t catch your breath after a walk to your street corner, however, you need to start slow and break up those 30 minutes of walking into two or three shorter walks. You want to enjoy it and make walking a habit. Try walking with a friend or join a walking club or group of mall-walkers at indoor shopping centers. Coffee hour often follows where you can make new friends – all good for your health, studies show. It’s important to set goals when it comes to walking. I’m impressed with the pedometers, electric step counters, on the market. They’re worn on the waist and keep track of the number of steps you take each day. Basically, they allow you to continuously monitor your progress, which helps for motivation and feeling as though you’ve accomplished something worthwhile. Although walking can be beneficial in the management of type 2 diabetes, there are some precautions you should be aware of. For starters, don’t begin walking if your sugar readings are too high or too low as complications may arise on your walk, which can put you at danger. Remember to inject your insulin away from muscles that are used during walking to avoid hypoglycemia. And lastly, make sure you drink plenty of water during your activity. If you don’t want to use a step counter, you can simply set your physical activity goals in terms of minutes per day. First, increase your walks by 30 minutes daily, working toward goals of 60 to 80 minutes. Also, keep in mind that if you do more intense physical activity like swimming laps in the pool, you can receive the same effects with less time. These days, though, you can also track your steps and receive free tips on increasing steps through various websites. In other words, you have every opportunity to bring your physical activity up to 2,000 steps per day and gradually increase your daily step goals from there. Needless to say, this study is good news for those living with the disease. But remember, it isn’t necessary for diabetics to do strenuous exercise in order to experience better health. Even small increases in physical activity over time can help reduce the risk and keep diabetes in check.